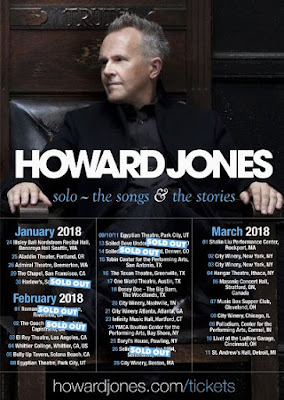 Howard Jones is returning to North America, this time on his own, with the "Solo: The Songs and the Stories Tour". Jones was just here in October with his Electric Band but, this time around, has decided to go a little more sedate. Joining Jones will be Rachel Sage who is putting the finishing touches on her new album, Myopia, which is due in May. Sage has often cited Jones as being an influence on her music and, last year, opened for him on his U.K. tour where Howard said that Rachel possessed "wonderful songwriting, arrangements and lovely vocals".